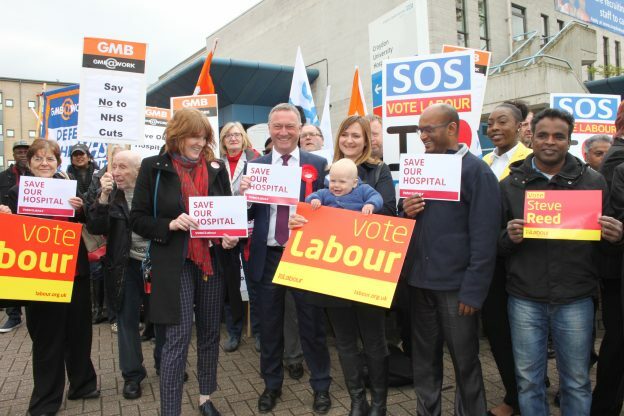 Labour campaigners claimed a big win after the health minister confirmed that plans to close Croydon University Hospital (the Mayday) have been dropped. The hospital’s uncertain future was a key issue in the general election. Labour’s Steve Reed and Sarah Jones both opposed NHS plans which listed the hospital as an option for closure because of Tory underfunding of the health service. The consultation on the future of the NHS in South West London stated that the current ‘five sites does not allow us to meet the clinical standards’ and that ‘in the context of limited availability of capital funding at a national level, one issue that we have considered is how much it would cost to re-provide acute services for south west London on three or four sites’. The plans then state that reducing the existing five hospitals down to four is the preferred option, with the Mayday one of the options for closure. But in response to a vocal campaign and continued pressure from Croydon’s two Labour MPs, the health minister Philip Dunne has confirmed that the hospital will no longer be under threat of closure. He wrote: ‘in light of your concerns about the future of Croydon University Hospital, Departmental officials have contacted NHS England’ and received assurances that ‘the NHS will not be proposing any hospital closures’. However, the minister has refused to rule out services being taken away from the hospital: ‘having five hospitals all providing every service may not be clinically or financially sustainable’. Steve Reed and Sarah Jones said the threat of further cuts to services is unacceptable. Speaking in Parliament, Tory ministers recently refused to confirm that Croydon’s NHS funding will ever be brought up to the London average. Croydon’s two Labour MPs are now seeking written guarantees that the Mayday will be given the same protected status as St George’s in Tooting, and that the current closure proposals will be officially withdrawn.